At the Berkeley Free Speech Week event, which was cancelled at the last minute when student organizers withdrew their sponsorship after accusing UC Berkeley officials of threatening them, a 37 minute+ documentary was to have premiered, created as part of the "America Under Siege" series by Dangerous Documentaries, this one titled America Under Siege: Antifa. After the cancellation of the Free Speech Week at Berkeley, Capital Research Center released the documentary on the Dangerous Documentaries website and at YouTube, where Trevor Loudon does an outstanding job of documenting not only the history of Antifa, but the rise of the group whose activities have been labeled "domestic terror" by the FBI and DHS, here in America. The film was written by and stars conservative author Trevor Loudon, directed by Judd Saul, produced by Jake (Joseph) Klein and Victoria Loudon, and executive produced by the Capital Research Center’s Scott Walter and Matthew Vadum. We are extremely disappointed by the cancellation of this screening and of ‘Free Speech Week’ as a whole. This is a major blow to the First Amendment, which we hope will be remedied in court. The fear of violence at this event, which was key to its cancellation, does not stem from anything we have done, nor from the actions of anyone else involved in organizing Free Speech Week. That fear is the fault of those who would use and have used violence to silence those with whom they disagree. Unlike the compilation clips that can be found over at YouTube showing the violence that has been associated with Antifa protests in Washington DC, Portland, Seattle, New York, Berkeley, California and Washington, since the beginning of 2017, this film provides the context and purpose of Antifa's groups, which uses what Loudon describes as "concept creep," - A two step process to first "vilify and dehumanize" those Antifa groups consider the enemy (meaning anyone that disagrees with their socialism ideology) and then to "destroy," that enemy, to ultimately overthrow the government of the United States. Along with interviews with high profile conservative names that have been threatened and/or attacked by Antifa groups personally, and historical goals of Antifa groups, as well as their recently stated goal to overthrow the duly elected government here in the United States, Louden also highlights the direct ties between these violent Antifa groups and the official Democratic party itself as well as their affiliates and allies, including organizations funded by George Soros. 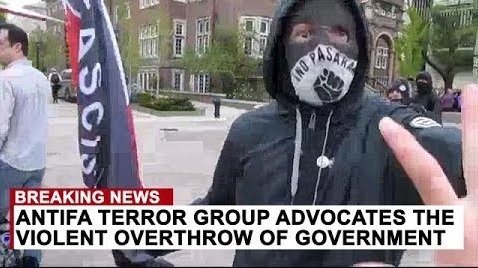 One example detailed in the documentary, is who is behind the violent Antifa protests that occurred at the May Day rally in Portland, Oregon, which descended into utter chaos when Antifa showed up, attacking police, setting fires, vandalizing police vehicles and launching projectiles "at police and firefighters including rocks, bottles, ball bearings, fireworks, smoke bombs, and road flares." Evidently, as visual proof has been obtained, these Antifa groups are not only funded or sponsored by Democratic affiliates, specifically the SEIU (Service Employees International Union) who donates heavily to the Democratic Party, spending even more millions against the Republican Party, and endorsed Hillary Clinton for president, but were also being trained in SEIU owned facilities, as is noted on the flier/poster shown below, at the bottom where it states clearly "SEIU Local." 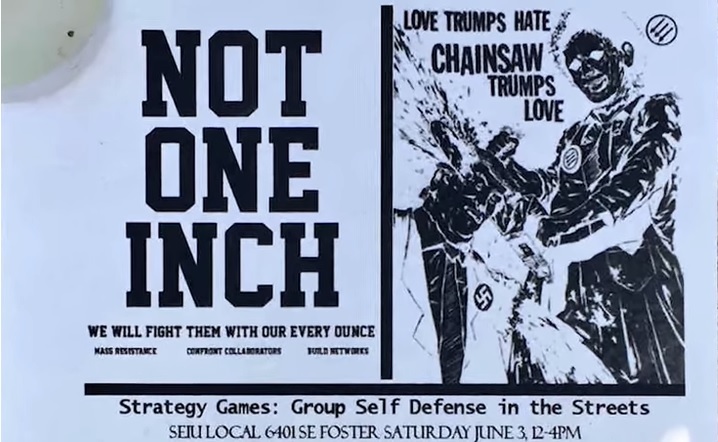 Note the three diagonal arrows in the upper right corner of the poster below, which matches the Antifa patches worn by some members, example at this link. 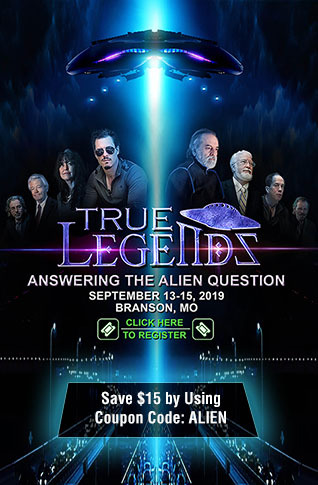 For those that do not have the time or the bandwidth to watch a 37 minute documentary, although it is highly recommended due to the well presented information contained within, we will recap some of the highlights of those affiliations. Another example: The leader of the Antifa group Knights of Socialism in Florida is Dylan Tyler. The Knights of Socialism is directly funded by the Democratic Socialists of America. Tyler also serves on the executive committee at the local DSA and the chairman of that committee is Adam Whitmer, who is also a regional field director for the Florida Democratic Party. At one point, the group appears to encourage a group of elementary schoolers on a tour to be part of the Trump bashing. The elementary schoolers beg the Knights to join in on the fun, which the group cheers on. Some children gleefully ask their teacher if they can "kill Donald Trump." The children shout and clap as the piñata falls to the ground. They scramble to seize the Twizzlers and other candy strewn across the lawn. One of the protesters was also spotted wearing an "Antifa International" sweatshirt. Campus Reform has a 13 minute video of that event posted on their website and article about it, titled "UCF socialist club urges young children to 'kill Donald Trump'." We also see in the documentary that the current Mayor of Berkeley, Jesse Arreguin, Former Mayor of Berkeley Loni Hancock, and current city councilor Kriss Worthington, were all Facebook group members of the Antifa affiliated group BAMN (By Any Means Necessary), which was largely responsible for the massive riot that caused $100,000 of UC Berkeley damage in February 2017, with another few hundred thousands dollars in damages to the city itself. Another little tidbit we find out in the documentary below is that the man representing Eric Clanton, the CA professor that was arrested and charged with four counts of assault with a deadly weapon after hitting four Trump supporters in the head with a bike lock when participating in Antifa protests, is a man named Dan Siegel. Siegel is also a Facebook group member of BAMN, and the former leader of the pro-North Korea Communists Workers Party, USA. That group has been known to publicly boast how they "utilize" the Democratic Party. 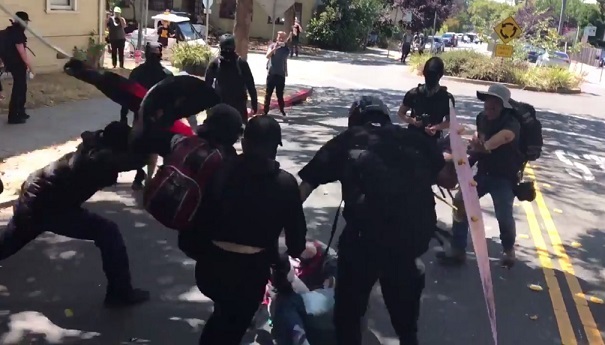 Given the information laid out in the documentary below, it becomes even more clear why, no matter how violent the rioting and chaos, the injuries the attacks on police and Trump supports, Democrats on the whole never once spoke up against Antifa and in fact, heavily criticized President Trump when he did so. It wasn't until late August after Antifa attacked Trump supporters and images went viral of masked, black clad members of Antifa attacking a man on the ground, punching and kicking him until another African American man jumped onto the victim to protect him, saying he thought they were going to kill him, that a Democrat, Nancy Pelosi finally deemed it necessary to speak to Antifa's violence. Even then, it was one rebuke after dozens of injuries and millions in damages across multiple states since January, all precipitated by Attacking Antifa members, with no follow up. That is because Antifa is the militant arm of the Democratic Party. Watch below: America Under Siege: Antifa - The full Documentary.